So here is the "rabbit" with clothing. 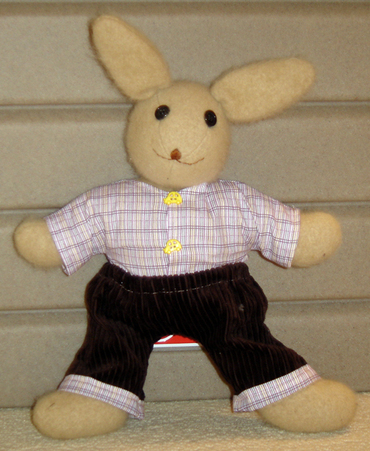 I made him brown cords with a purple & yellow striped reproduction print fabric for his top. The buttons are cute yellow cars left over from another project long ago. I'm still not sure if he is totally complete, but for now he will have to do. I can't detach him from Miss J's arms, not even to brush her teeth. He does have a very contented look on his face. He is a part of her world now whether I intended him to be or not. ...and so it goes I will be making another bunny in the very near future for Miss A. Perhaps a girl rabbit to keep our boy company :) At the very least it should provide inspiration in the naming department. That is adorable! Not something for me though. I mess up anything that requires me to work with a pattern. Don't ask me how, I know it's simple, but I still manage to destroy it one way or another. You are more creative than I am. what do you need when you turn 40?